The little town of Much Wenlock in Shropshire is most known as the birthplace of the modern revival of the Olympics. It is also linked to A E Housman, for the road on Wenlock Edge, the high escarpment with its troubled wood made famous by his poem, leads to the town. It does not have a railway station and it is not near any major roads, so in some ways it is left to itself. As sometimes happens with characterful secluded places, it is, however, often busy with interesting things. It has a small outdoor market hall where local crafts, foods and hand-made goods are offered. There is an art gallery, a pottery and an antiques shop, and, more unusually, an ecclesiastical outfitters. If you need a cope or a chasuble, or a pyx or a thurible, here is your place. And it also has two second-hand bookshops. At the first of these, my colleague in assiduous book collecting, Mr John Howard, spotted tucked inside a book by Dennis Wheatley, an old set of four joined tickets for sixpenny afternoon beach chairs. As will presently appear from a story yet to be published, I have a certain interest in old tickets – the printing and design and the faded colours, together with idle notions about the previous owners, appeal to me. Also, not all that many survive: tickets are not the sort of thing people keep, unless for sentimental reasons or by chance when they are used, as perhaps here, for a bookmark. 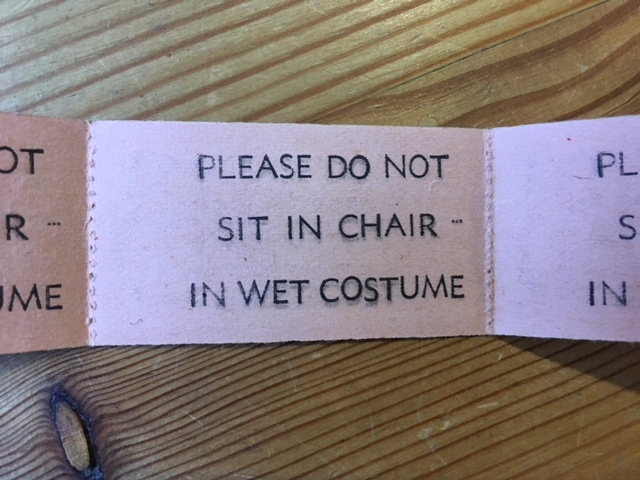 This example includes on its reverse, as an extra delight, the rather plaintive injunction, ‘PLEASE DO NOT SIT IN CHAIR IN WET COSTUME’. 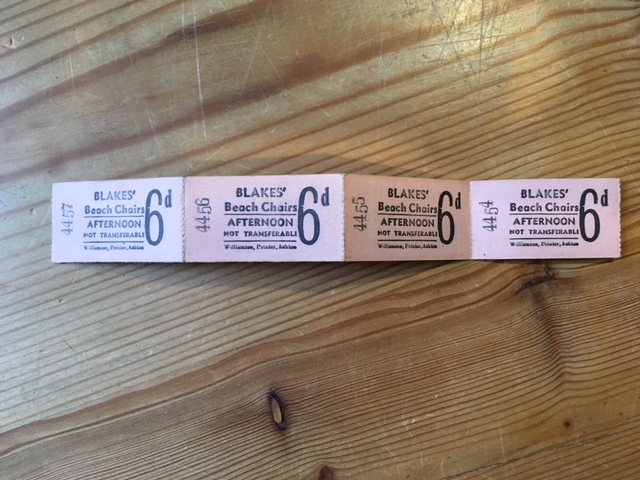 I am sorry to say I did not much fancy the Wheatley book, but I did like the tickets, so I negotiated with the bookseller to transfer these ephemera to a copy of Rose Anstey by Ronald Fraser, in dustwrapper, which I was very pleased to find. Of course, now I wonder if I did the right thing. Ought not the tickets to have remained in the book where they had been for who knows how many years? Perhaps some lingering spirit of romance linked the tickets and the book, which I have now severed. Who were they, that family of four, or that quartet of friends on a spree, or those two pairs of lovers, who held those tickets long ago? What waves did they watch together, seated on their four borrowed striped canvas deckchairs, which were (we trust) unsullied by damp posteriors? I don’t doubt that if I go back to the shop and the Wheatley is in its place I shall have to get it and reunite it with its ticket, trusting that this pious intention, at least, will assuage the lingering sad ghosts that may still be pining within. At the second bookshop in Much Wenlock, Mr Howard secured half a row of a nice reprint of E F Benson’s ‘Mapp and Lucia’ novels, while I alighted upon a very battered copy indeed of These Charming People by Michael Arlen. This collection of witty, debonair, slightly melancholy tales was a delighted discovery for me, after I was introduced to it by my esteemed friend P J Beveridge, the editor of Crash Smash Crack Ring zine, the gentleman who recklessly accepted some of my earliest writing. 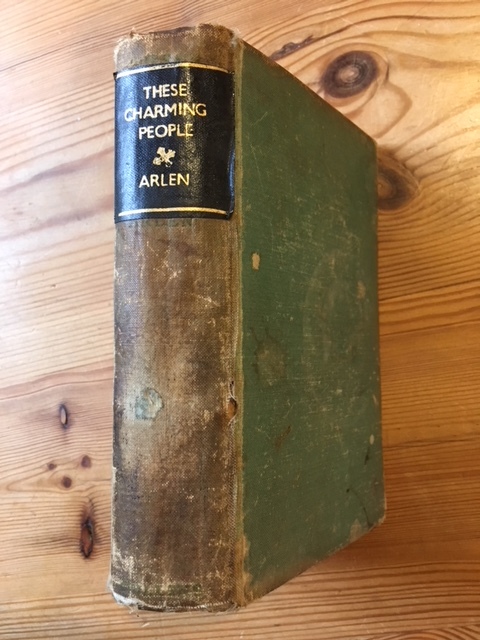 So pleased was I by Mr Arlen's book that I soon founded the world's idlest literary society, also called These Charming People, which has no aims, no rules, no activities and no publications, but does not discourage the reading of Arlen or the invention and consumption of exotic cocktails. The covers of the Much Wenlock copy are really most remarkably knocked about and marked. There is the ghost of a tea or coffee cup stain which looks like the outline of a distant half-known planet. Some of the other spots and splashes have eaten away at the green cloth – what bitter acidic substance was once casually spilt upon it? The spine has lost almost all its verdant hue in exchange for a colour like old brass or the stalks of dead flowers in winter. On the back cover there is a network of white scratches as if some discontented creature had vented its claws upon the book. In certain lights, though, they seem to suggest a map of ancient landscape markings seen from the air and made for imponderable reasons by a lost people. This copy was published in The Green Leaf Library by Collins, and the copyright page proclaims it the Eighteenth edition, August, 1932, following another reprinting only two months before. The long column listing earlier editions is proof of how popular Arlen continued to be. And there is further evidence in the book that this warmth for his writing continued for quite a long time after that. 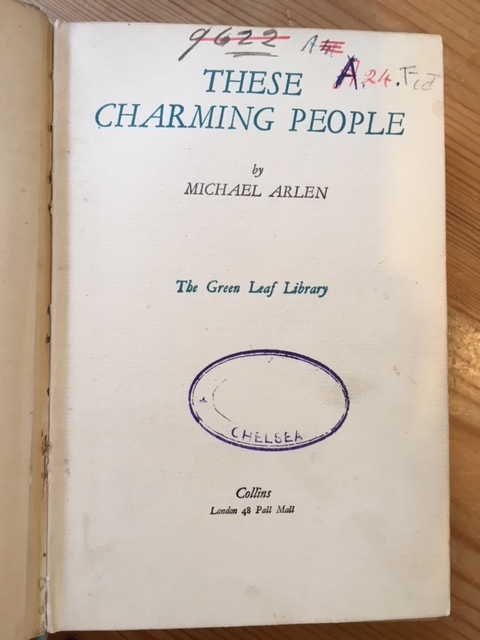 For this volume has come from what was probably a private lending library: there is an oval stamp on the title page in a sort of violet-blue, of which the only word that has made it through the impress is ‘Chelsea’. The library has also pasted on the spine its own title panel in sable and gold, with the flourish of a fleuron too, suggesting it aspired to a certain distinction. 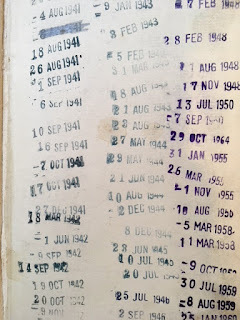 However, instead of affixing a sticker for recording return dates for the book, the library has rather casually bashed them straight onto the free front endpaper, both recto and verso. 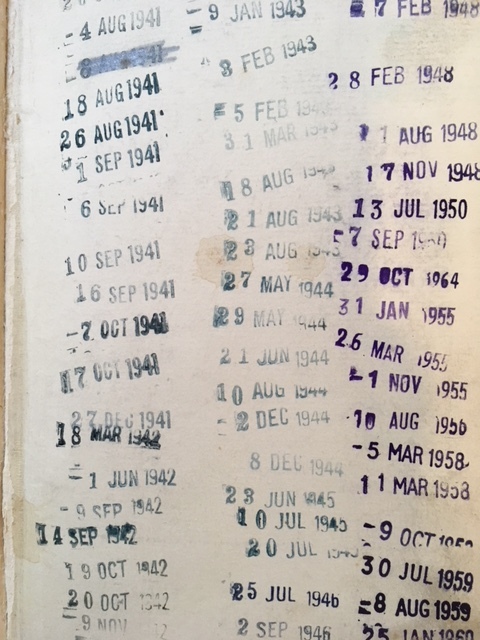 The first date is 26 July 1941 and the book was scarcely out of someone’s hands all through the Summer and Autumn of those days of the Blitz until Christmas. Eager readers resumed taking it out in March 1942 and carried on pretty frequently until interest begins to peter out a little in the late Forties. Even then the book still had its readers, a few a year, until the last date recorded, 26 January 1970. 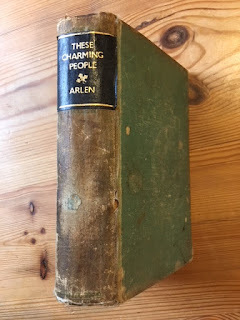 Perhaps it then retired to the dimmer shelves while the affection for Michael Arlen’s books waned in the later 20th century, or it languished in some sort of reserve stock. What happened between then and it finding itself in a corner bookshelf of the upper floor of a bookshop in Much Wenlock, waiting to see if its Charming People would ever parade again before the eyes of an eager reader, probably only its pages will ever know. 26 January 1970 - last taken out on the day I was born. Clearly, you must be the book's reincarnation. I hope we shall have that opportunity, Michael. Helen and I have sampled the delights of the outdoor market and both second hand bookshops on several occasions, it about an hour away by car from our doorstep. Aha, that explains where all the Machens and Blackwoods and Aickamns and Snaiths had gone...pre-plundered! Sadly, I have not found many rare titles in these and other bookshops. The only original Aickman book I have ever found is a paperback copy of Powers of Darkness. I recently acquired the 1956 reprint of The Empty House by Blackwood at Aardvark Books in Shropshire. None of which comes close to your recent finds in Llanidloes. Only a couple of days ago we popped over to a local second hand bookshop at Dagfields, the only title found was a tattered copy of Hilton's Knight Without Armour, the seller wanted £20 for it, which seemed excessive, so I left it behind. The only other recent find was a blind purchase, it mentioned voodoo and a climax to rival Hamlet! It was only £2 (Make the Corpse Walk by Raymond Marshall)on returning home I found out is actually written by James Hadley Chase.